At left, Julian Ribushofski (#19) of Greenwich shoots the puck that beat Fairfield Combined goalie Will Capalbo (#30) for a goal during the boys high school ice hockey game between Fairfield Warde/Ludlowe combined teams and Greenwich High Schools at Hamill Rink in Greenwich, Conn., Thursday, Feb. 15, 2018. FAIRFIELD — By his own admission, Will Capalbo is reserved by modern day high school standards. Even so, the Fairfield Ludlowe senior found himself having a moment in late January. Capalbo’s spent much of the winter shuttling back-and-forth to the Dana Farber Institute in Boston as he prepares to undergo a bone marrow transplant to help his older brother Charlie, who is battling a form of leukemia. 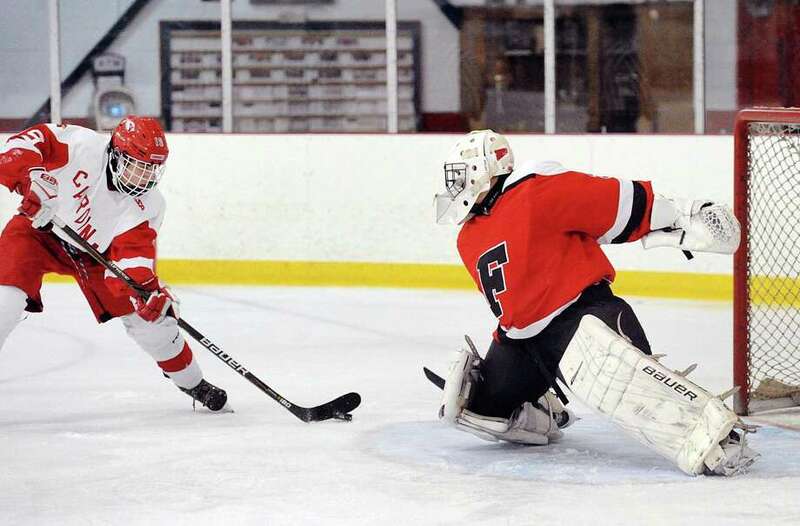 At the same time, Will Capalbo has found time to excel in goal for the combined Fairfield boys varsity ice hockey team. “Last night I was driving myself home from pre-op appointments. It was pouring rain. I was just outside Boston,” Will Capalbo said by phone last month. “Did I ever think I’d be like this right now? Another part is, day by day, I just want to help my family and my brother and get through it together. Tuesday night Will Capalbo played his final game in goal for Fairfield against Norwalk/McMahon. He posted a shutout in a 10-0 victory. Afterward, he planned to drive to Boston — with a camera crew from NBCSN’s “Hockey Day in America” in tow — to make final preparations for the transplant operation early next week. On the ice, Capalbo’s play in goal — and locker room leadership — is a big reason why the Mustangs are 7-5-1. Capalbo said the drives to Boston leaves him tired more than anything else, but he wouldn’t have it any other way. To prepare for the transplant he changed his diet and exercise routine, making him feel healthier. The experience also made him more-independent. “I’m more, kind of, focused and in all areas. I can do this for my brother and it was a huge pick me up for everybody,” Will Capalbo said. Charlie Capalbo also played hockey for Fairfield and was first diagnosed with non-Hodgkin lymphoblastic lymphoma T-cell Stage 3 cancer in March of 2017. Treatments helped him put the disease into remission, but last October doctors found something in his spinal fluid. It was eventually diagnosed as a form of leukemia and prompted the need for the transplant. When Will Capalbo found out he was a perfect match for his brother via a family FaceTime session, he didn’t even think twice. Capalbo remains optimistic about returning to the Fairfield squad by the playoffs. His teammates know losing him in goal — for at least the rest of the regular season — will be difficult, but they’ve rallied around the Capalbos and as a result have become a closer-knit unit. Fairfield continues to wear a patch for Charlie Capalbo on their jerseys and have raised money throughout the season to help.